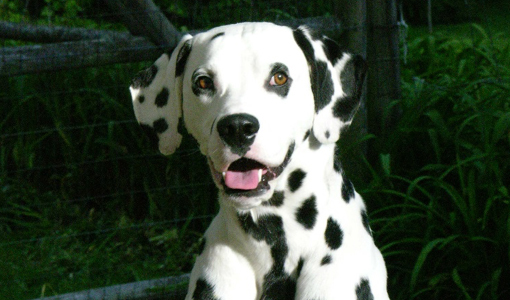 Cole, a 10-year-old male neutered Dalmatian, was presented to the Cummings Veterinary Medical Center’s Emergency Service with stranguria. He had a large, unexpressable bladder, a III/VI systolic murmur on the left side, ventral pyoderma, and hyperemic paws. Body weight was 27 kg, with a body condition score of 4/9 and a normal muscle condition score. A urinary catheter was placed to relieve the obstruction. A urinalysis revealed urine specific gravity = 1.030, pH = 6.0, with no protein, glucose, or ketones and an inactive sediment. Abdominal ultrasound revealed numerous small stones in the urinary bladder. Cole had recently visited the Dermatology Service for his chronic skin issues. A diet trial to test for food allergy was recommended but it had not yet been started. Cole was fed an adult maintenance duck-based dry diet and received venison and potato dog treats. He had been fed a number of different diets and treats in the past, with varying ingredients. An echocardiogram showed moderate mitral regurgitation and mild left atrial enlargement consistent with myxomatous mitral valve disease (ACVIM Stage B2). The dog was taken to surgery for a cystotomy where numerous small yellowish stones were removed. Once the stone analysis came back (100% urate), the owner scheduled an appointment with the Clinical Nutrition Service to identify an appropriate diet for his multiple health conditions. What nutrients/diet properties are most important for prevention of urate urolithiasis? What about addressing his heart disease or skin allergies? The most important nutritional strategies for reducing episodes of urate urolithiasis are feeding a diet that is low in purines (not necessarily low in protein), alkalinizing, and high in moisture. Some diets that are marketed for urate prevention are very low in protein and phosphorus; these diets are more appropriate for renal disease than they are for long-term feeding of an otherwise healthy dog with urate stones. In general, purines are found in higher concentrations in animal tissue, especially metabolically active tissues such as organ meats. Purines are low in ingredients such as egg, dairy, and many plant-based ingredients, including soy. Diets based more on plant proteins than meat proteins also tend to be naturally alkalinizing. Cole also has heart disease and dietary strategies that may be of benefit include avoiding excess sodium and supplementing with omega-3 fatty acids. His dermatologist suspects a food allergy, but a diet elimination trial has not been completed. With his history of being exposed to a large number of proteins, finding a diet that contains novel protein and carbohydrates for use for an elimination trial, while being appropriate for his other health conditions is unlikely. Whether or not Cole has a food allergy, omega-3 fatty acids from fish oil may have benefits for reducing his allergic symptoms due to their anti-inflammatory properties. The Clinical Nutrition Service recommended a dry hydrolyzed soy therapeutic diet that contained <100 mg/100 kcal sodium. This diet was low in purines, and also suitable for a dietary elimination trial because of the hydrolyzed proteins. Cole was supplemented with fish oil (65 mg/kg DHA + EPA) and because the diet was only available as a dry option, the owner was instructed to add 3 cups of water to each cup of food. The owner was very compliant, and the dog was closely monitored by both the Internal Medicine and Clinical Nutrition services to ensure specific gravity was <1.020, urine pH was >7 as much as possible, and that body weight was stable. Food allergy was ruled out since the pruritus did not resolve during the diet trial, but the owner continued to work with the Dermatology Service to control his pruritus. Although food allergy was no longer an issue, the hydrolyzed soy diet was continued because it was nutritionally complete and balanced and because it met his other nutritional goals. Two years later, Cole remained stone-free, with well-controlled pruritus, and only mild progression in his heart disease.